Rotten Tomatoes Plot: An unprecedented cinematic journey 10 years in the making and spanning the entire Marvel Cinematic Universe, Marvel Studios' "Avengers: Infinity War" brings to the screen the ultimate, deadliest showdown of all time. 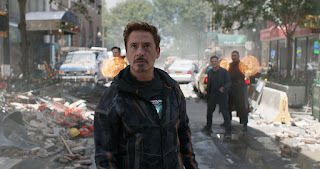 The Avengers and their Super Hero allies must be willing to sacrifice all in an attempt to defeat the powerful Thanos (Josh Brolin) before his blitz of devastation and ruin puts an end to the universe. Directed by Anthony & Joe Russo. How many Marvel superheroes does it take to change a light bulb? According to the Russo brothers... as many as possible. Avengers: Infinity War is a cinematic smörgåsbord, the likes of which we'll never see again (until next year's sequel.) Trouble is, most of it is unnecessary, save for Brolin's impressive Thanos and a few cute one-liners, courtesy of the Guardians of the Galaxy & Spider-Man, who says it best, "Sorry, I can't remember everyone's names." Me neither. Aimed squarely at a rabid fanbase who craves (and can keep track of) multiple characters/locations/storylines, nonstop action, and zero filter.